After my truck overheated a couple of weeks ago I decided that I want a real temperature gauge. Now that I have the gauge in hand, I can't decide on the best way to install the sensor and am seeking some input/advice of any kind. I have two options from what I can see. Any and all thoughts or suggestions on the best way to install this sensor are welcomed and very much appreciated. I use an adapter. I found it on Ebay . I could not buy the material for what I paid for it. It works fine. Easiest route ever. 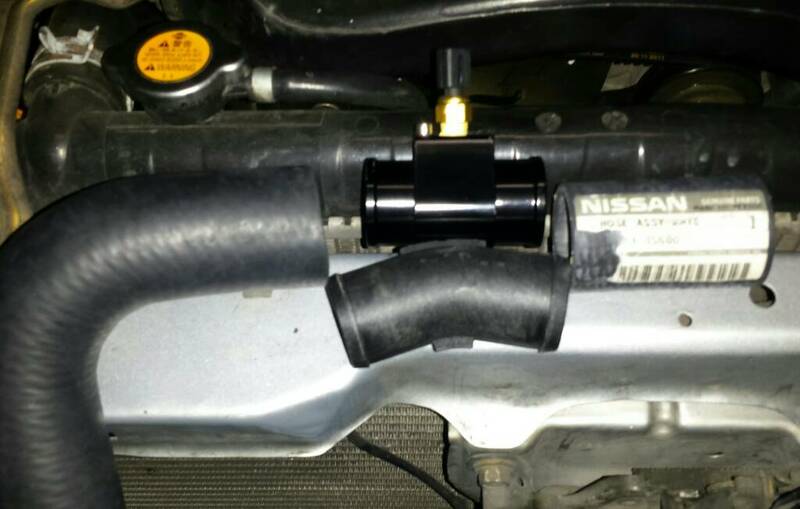 Mounts in the upper rad hose, five minutes cut the hose and install the adapter. The sender that came with the Autometer kit fit perfectly, a little teflon tape wrap and you are golden. Threaded in perfectly. Dont forget a ground lead back to the fender etc or you will have no signal. Mine has been in for almost a year now and works great. 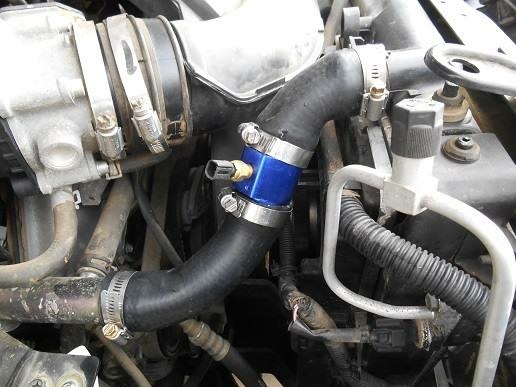 Replace the junk Chinese supplied hose clamps with some Ideals and the install's done. 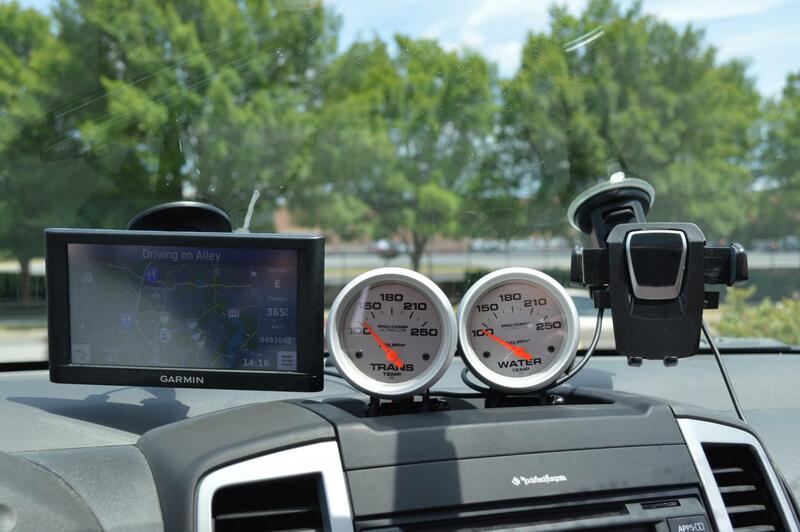 I'm leaning toward this (#1), if you feel the need to add an aftermarket temperature gauge. Ebay is where I got mine from too. Which hose do you think would provide a more accurate reading, upper or lower? The gauge I have is a 2 wire. Any particular reason you chose the upper hose and not the lower? Which do you believe would provide a more accurate reading? 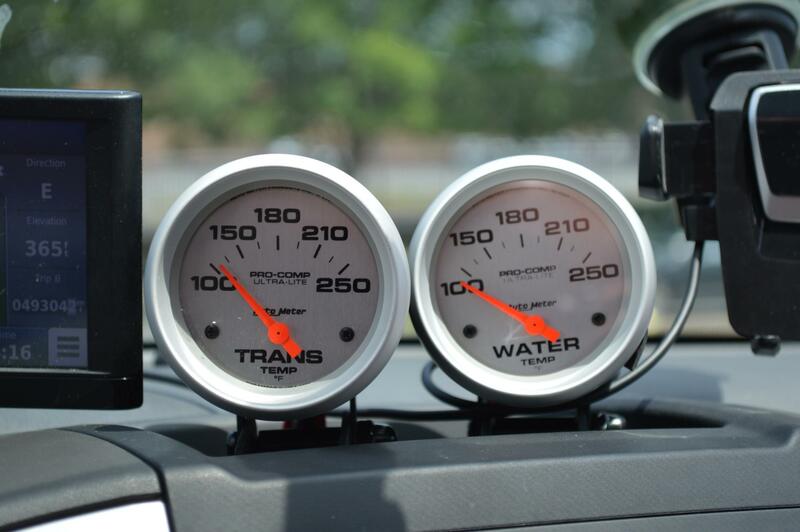 Why is your water temp gauge crooked? Haha...just giving you a hard time. I believe the sensor doesn't communicate with the ecu/ecm. The bigger one next to it does. 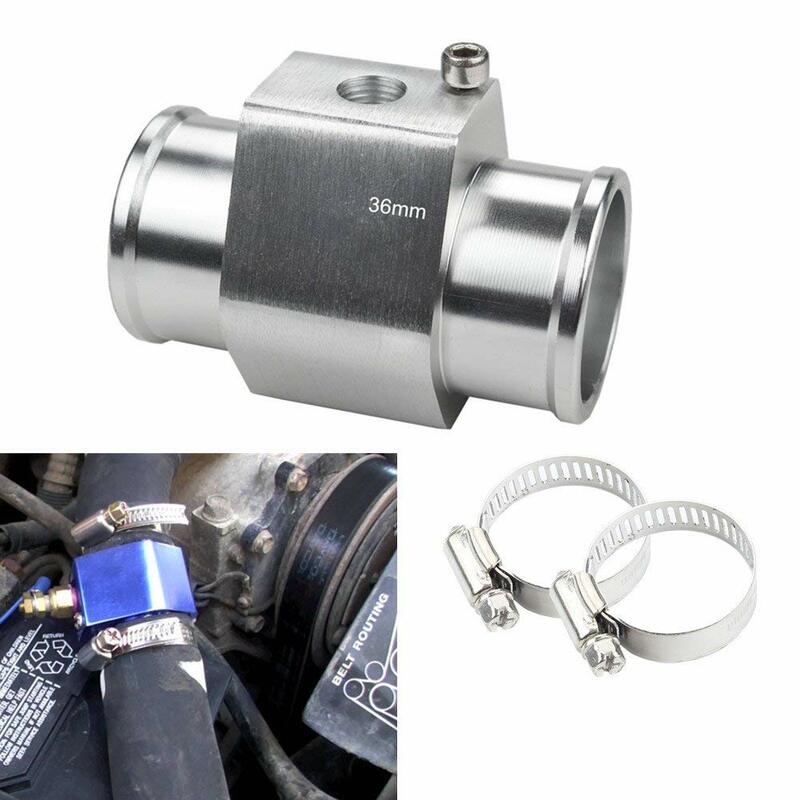 But I would hate to lose oem gauge functionality so I am leaning toward using the aluminum adapter. I don't know if the answers to my questions would be any different due to the fact that my truck is a 1st gen KA24DE engine while you guys are 2nd gen....with Cusser being the exception. Ebay is where I got mine from too. Which hose do you think would provide a more accurate reading, upper or lower?The gauge I have is a 2 wire. Any particular reason you chose the upper hose and not the lower? Which do you believe would provide a more accurate reading? 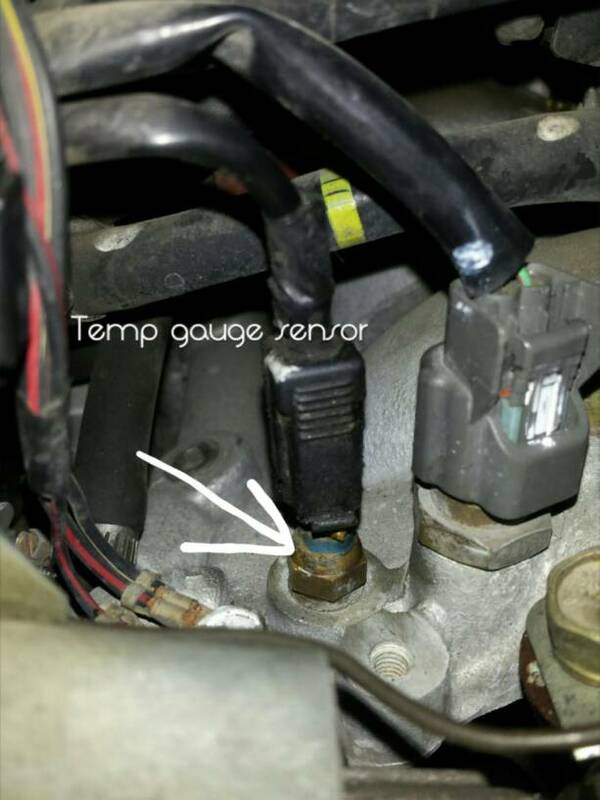 Why is your water temp gauge crooked? Haha...just giving you a hard time. I believe the sensor doesn't communicate with the ecu/ecm. The bigger one next to it does. But I would hate to lose oem gauge functionality so I am leaning toward using the aluminum adapter. Butterman, the crooked guage is a race car trick, they spin their gauges so that all the pointers line up at the 12 oclock position when the readings are normal. If you see something out of the corner of your eye not standing up, then you know you have an issue. I haven't got around to clocking the trans temp gauge yet cause I had no idea what the normal range would be for that indicator when I built the pod. As to the hose chosen, the upper was easiest to reach in a very tight engine bay, so upper it was. Would the lower hose temp be different? Quite possibly, but this at least gives me a real actual reading, w/ useful information, not that moronic three position "tree" that's either Cold, Normal or YJBYE ( You Just Blew Your Engine ). GM used to be famous for that gauge style as well, I dont think they do that anymore. The Cuss is always an exception. I'd say use upper hose because that would be coming from the thermostat outlet. But what if I have a thermostat stuck closed situation? Would I then not get a true temperature reading? Lol. I don't doubt that at all sir.